Regular readers of my blog will know that I like puzzles in my games, and will have already read about this rune puzzle. However, as it has been quite some time since I last posted about them, I thought I would make another post for the end of the year, as I begin to finish off this section of the module. This area was always going to be one of the last parts I worked on for the module, as it involves quite a bit of custom code based around the theme of using runes. 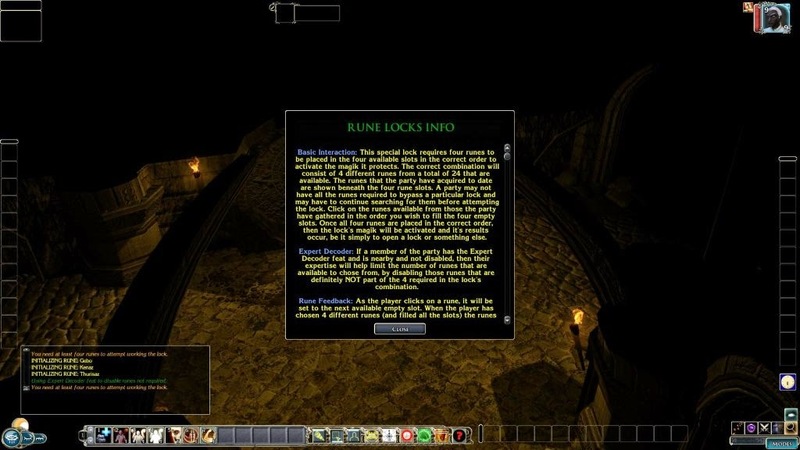 Note, some rune puzzles are not scenario specific and will appear throughout the campaign. However, this particular use of them is very much geared to this dungeon. Obviously, I won't go into detail, but it will be clear that the heroes will have to find runes throughout the dungeon to be able to continue their quest. The hero finds a sturdy bag containing three runes! 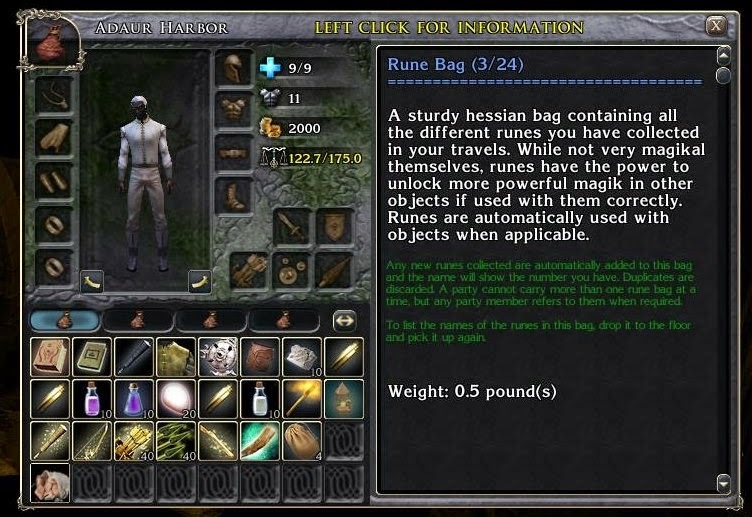 Rune bag information displayed in the new inventory! When the heroes discover an object where they can use the runes they have found, then an interface automatically updates according to the runes they have already acquired. Note, the runes they have found may be useable in different ways, and so tactical use of them with the different objects may be required. Not enough runes carried to work with this object! I have made a couple of updates since my last post about this rune puzzle. One particular difference is that, as in many other areas of in-game puzzles, I have added a button that gives the player access to more detailed instructions if need be. 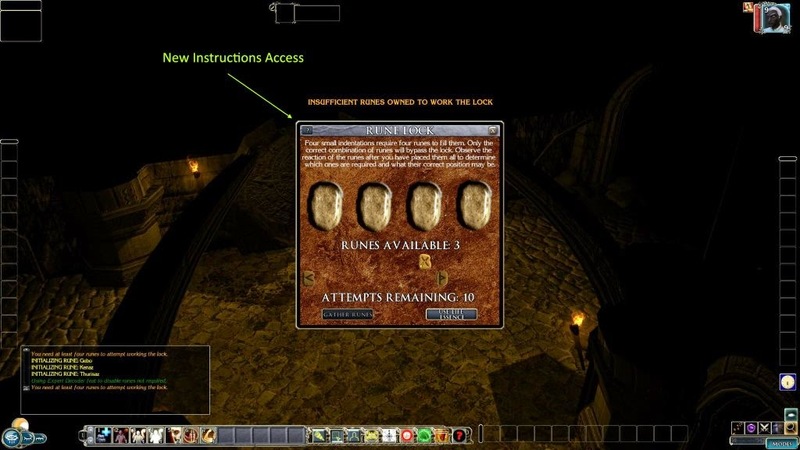 Player has access to detailed instructions for puzzle. Anyway, it's that time of year when I seem to slow down even more than usual (lack of sun probably), and so will be taking things a little easier for a few weeks (as if I did not take things easy enough already). However, as I have explained before, as a Christian, I do not celebrate the upcoming season festivals, which have their background in pagan rituals and are a man-made addition to what God has instructed us regarding worshipping Him, and so will, hopefully, not be restricted to updates on the module on account of this.